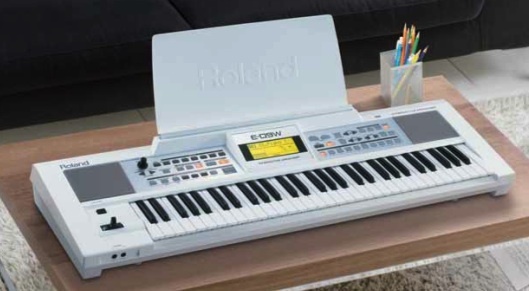 Roland has brought out a white version of its E-09 interactive arranger keyboard, unsurprisingly titled the E-09W. The E-09 features 61 velocity sensitive keys, 64 notes of polyphony, 32MB of wave memory comprised of 870 tones and 70 drum sets, 47 different effects, 130 styles, 100 user programs, sixteen track recorder, pitch bend and modulation wheels. Geared towards those who just want to make music from the box, the E-09 is loaded with dozens of one-touch patterns that players can control and embellish for an impressive performance. An Easy Mode provides quick, friendly operation while One-Touch settings and friendly Music Assistants make navigation and music creation a breeze.